Been at the 10 spot 2 times to get my hair curled and styled. My experience was great both times, my hair styled the way I wanted. This is my go-to place now. The least traumatic shellac removal I've ever had - Ariel was great. I had a manicure and pedicure with Nabina and could not be more pleased! She did a fantastic job and I really enjoyed her company throughout. I would definitely return and book with Nabina! Best mani and pedi I’ve ever gotten in Toronto! Ada was beyond amanzing! Thank you. Love love that they've relocated to Bay and Richmond. Beautiful space with the amazing service and quality I had expected! Thanks 10spot! This location is such a dream! The gals are amazing and suuper friendly! To top it off, the location is so so convenient and I'm really digging the windows!! I definitely recommend! A compact version of Ten Spot. Efficient and courteous service. Offers typical range of services: Mani, pedi, waxing, etc. Full windows on 2 sides with unobstructed view of Bay and Richmond St - also means you're visible from the street! Went to see Apsara for threading. Kind staff. Cute, relaxing and cleanly location. Very happy with the whole experience. Walked in, asked if they had any availability and yes they did! They accommodated me last minute and did an awesome job on my brows. The aesthetician was very gentle and did her job well! Ada is such a great esthetician! She always goes through the extra effort to make sure I’m happy with my results. I was really sick last week and she was so accommodating when I had to cancel an appointment. Natasha and Veronica were also very helpful with rescheduling my appointment and were very sweet about it. Thank you girls! Waxing is never fun but Tanya made my experience really pleasant! She went above and beyond to make me feel comfortable and minimize the pain - 24 hours later and there are no bumps or irritations to speak of! The space was clean, everyone I interacted with was lovely, and I have zero complaints! I had a little trouble finding the new location coming from the station, but wow it looks great! As I stepped in I was greeted and asked if I wanted anything to drink which was perfect after the running around I did to find it! My appointment started on time and my esthetian was absolutely lovely. I only had a mani done, but she was very attentive and asked throughout the whole process if everything was to my liking. I look forward to visiting her and this location again. I definitely recommend here and Cass T if you need excellent service! I had Nabina today - She was amazing. I have had a few bad experiences lately with waxing my eyebrows so she suggested threading. Usually this is very painful so I was hesitant but in the end agreed. My eyebrows have NEVER looked better! I am extremely happy! Also she was able to pick out the perfect colour for my nails. My apologies for MY distraction today -- my experience at the Ten Spot HBC Queen was excellent -- my terrible distraction came at the hands of Guardians of the Galaxy Vol II which was playing. (Dear Lordy, was I ever visually distracted!) But, thankfully, proof of the Ten Spots excellence comes by way that my fingers look BEAUTIFUL (despite my absentminded-gawking-at-Groot-ness)! And I solemnly swear that hand-washing/scrubbing the fine china is done until next December when I crack it out again, so I will be able to actively protect this pretty manicure! This was my first time at The Ten Spot and I had such an amazing experience! The salon was so clean and chic and I really enjoyed my pedicure by Shaen. She was so thorough and my feet felt and looked great after. I already recommended this place to my friends and coworkers and will be coming back for sure. The salon is bright and clean and the staff are friendly. My first experience was not great but they were quick to aknowledge their mistake and offerred adequate compensation for the poor first experience. 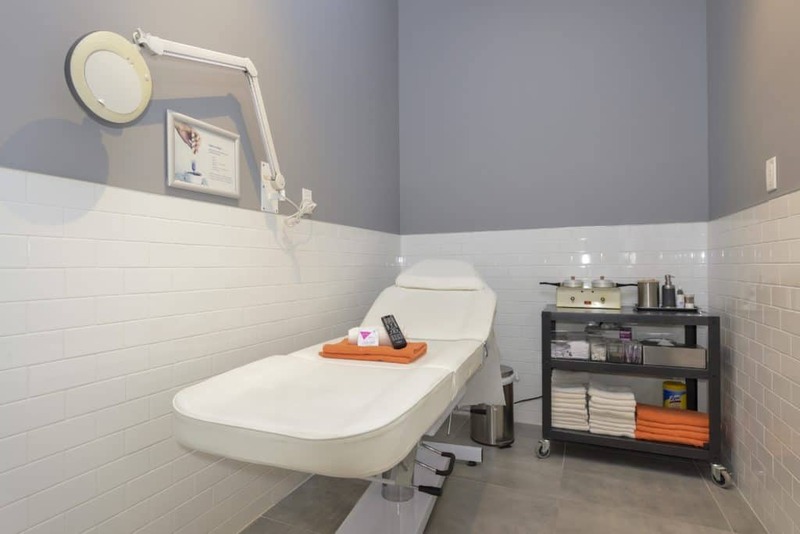 My second time there was great, the girl who did my waxing was very professional and informative as I was trying something new. I'd be happy to continue going back here for their waxing services, though I was not impressed with their mani skills.